As a leading plastic surgeon in San Francisco, Dr. Ramin Behmand strives to exceed patient expectations in every aspect of his aesthetic enhancement practice. With this philosophy in mind, he decided his website should offer the same level of excellence to his online visitors, so he recently collaborated with Rosemont Media and our team of writers, designers, and developers to upgrade to a responsive design. As a result, both current and prospective patients can find a welcoming, convenient, and informative resource on cosmetic procedures for the face, breasts, and body. The adaptable format, which allows visitors to view content and practice details on any Internet-compatible device, is just one of the many features of the new design. By utilizing a visually appealing layout and easily navigable interface, users on smartphones, laptops, tablets, and desktop computers can now browse a gallery of before-and-after photos, patient testimonials, compelling blog posts, and more from the drop down menu located at the top of the site. With his expansive collection of procedural information on popular cosmetic treatments, including breast augmentation, facelift, liposuction, and non-surgical rejuvenation, Dr. Behmand also hopes to help individuals considering aesthetic enhancement become better informed about their options. In addition to increased functionality and an inviting layout, the practice website also features innovative medical SEO strategies that help to position the site high on the results pages of Google, Bing, Yahoo, and other search engines. Dr. Behmand believes maintaining a strong presence online is an essential responsibility for any modern medical business trying to connect with patients. 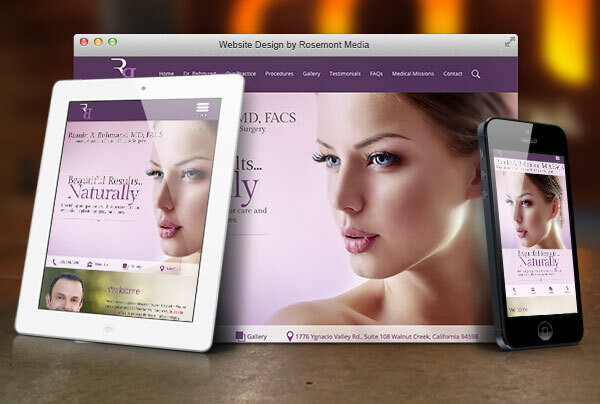 To see an example of the state-of-the-art, customized plastic surgery website our team at Rosemont Media can design for your practice, please visit drbehmand.com.